That's not a typo. 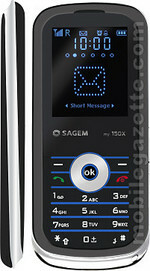 Sagem's new my150x will cost just a tenner with a pay-as-you-go contract on Orange, and is on sale in Asda supermarkets now. That's less than a bottle of wine (if you're posh) or three bottles of wine (if you're not). That's without a doubt the cheapest prepay phone ever in the UK. Are you being fobbed off with rubbish features though? The 1.8-inch screen takes its cues from old-skool calculators, so don't expect to be watching videos or sending picture messages (nope, there's no camera either).